Join us on March 29, 2018, at 11 AM EST, for a lively discussion of the phenomenon of transhumanism and how narrative tropes in speculative fiction shape our imagination about human enhancement. 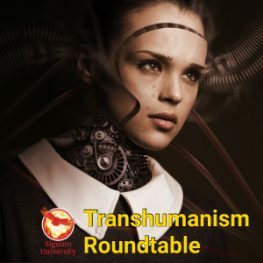 Our presenters will talk about poshumanism versus transhumanism, our hopes and fears for the future, theology and transhumanism, and perhaps even ask the question: what is the non-human singularity? James Hughes, Ph.D., is a bioethicist and sociologist who serves as the Executive Director of the Institute for Ethics and Emerging Technologies, and as the Associate Provost for Institutional Research, Assessment and Planning for the University of Massachusetts Boston. Ted Peters (Ph.D., University of Chicago) teaches systematic theology at the Graduate Theological Union in Berkeley, California, USA. He co-edits the journal, Theology and Science, at the Center for Theology and the Natural Sciences. Along with two colleagues he is editing a new book, Religious Transhumanism and its Critics. Soon to be published is his fiction thriller with a Transhumanist plot, Cyrus Twelve, with Aprocryphile Press. Visit his website: TedsTimelyTake.com. Yannick Imbert is professor of apologetics at Faculté Jean Calvin, France. His main interest is in the intersection of faith and society. He completed his Ph.D. on J. R. R. Tolkien’s view of imagination and has written several articles on Tolkien. He has a long interest in transhumanism, particularly from a theological perspective. Sørina Higgins is the Chair of the Department of Language and Literature at Signum University and a Ph.D. candidate, Teacher of Record, and Presidential Scholar at Baylor University. At Signum, she serves as Thesis Coordinator, Host of Signum Symposia, and Preceptor for courses on the Inklings. Her interests include British Modernism, the works of the Inklings, Arthuriana, and magic. She holds an M.A. from Middlebury College’s Bread Loaf School of English, where she wrote about Sehnsucht in the works of C. S. Lewis. She blogs about British poet Charles Williams at The Oddest Inkling. Sørina edited an academic essay collection on The Inklings and King Arthur (Apocryphile Press, 2018), wrote the introduction to a new edition of Charles Williams’s Taliessin through Logres (Apocryphile, 2016), and published an edition of The Chapel of the Thorn by Charles Williams (Apocryphile, 2014). As a creative writer, Sørina has published two books of poetry, The Significance of Swans (2007) and Caduceus (2012). Join us on March 29, 2018, at 11 AM EST.